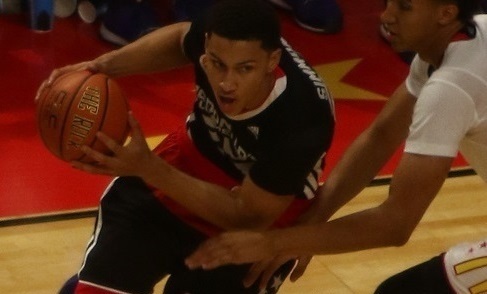 Ben Simmons (pictured driving to the basket above) is expected to be the #1 overall pick in Thursday's NBA Draft. Simmons has been the consensus number one pick for a while now. Physically he has everything you want in a potential NBA superstar. At 6’10 and 230 pounds no one will be able to push him around. He has an extremely high basketball IQ and can do virtually anything asked of him on a basketball court. The only knocks against him have been his inconsistent shooting and questionable commitment. That being said, LeBron is more likely to play in Europe next year than Simmons not wearing a 76ers jersey. (Update: A report from Cleveland.com and confirmed by ESPN, says Philadelphia has promised Simmons that he will be the #1 pick). Brandon Ingram is the second part of this “two player draft”. Ingram is a 6’9 forward who handles the ball like a point guard. Some members of the media have even claimed Ingram to be the next Kevin Durant. Although I wouldn’t go that far, it is undeniable that there are some similarities between the two players’ games. Ingram can shoot from just about anywhere on the court and his 7’3 wingspan makes his shots almost unblockable. Ingram will need to improve on his strength as he will now have to deal with a grueling and physical 82 game NBA schedule. Expect the Los Angeles Lakers to take Ingram Thursday night, without a second thought. This is where the draft gets tricky. After the first two picks of this year’s draft the talent pool begins to dry up quickly. The Celtics have been trying to move this pick for a while now, but haven’t found the right deal. If they do decide to keep this pick, expect them to take Kentucky sharp shooter Jamal Murray. Murray is a knock down 3-point shooter, who could instantly add offense to a Celtics roster that desperately needs it. Many think that if the Celtics are looking for shooting then they should take Oklahoma star, Buddy Hield instead. However I believe the Celtics will prefer Murray’s catch and shoot approach rather than Heild’s “street ball” style of offense, as it would clash with Isaiah Thomas’s game. With the fourth pick in this year’s draft the Phoenix Suns will look overseas and select the young Croatian, Dragan Bender. I know many fans will roll their eyes at this pick and label it as another tall skinny foreigner who can shoot. However, I would caution you not to rush to judgment, Bender is 7’1 big man whose best skill is not his ability to shoot but instead to run the floor and distribute the ball. The Suns could really use a big man who can space the floor and distribute the ball to shooters like Eric Bledsoe and Devin Booker. At 18 years old Bender will be a project, but I believe he will be a project worth working on. The Minnesota Timberwolves already have the best young core in the NBA, so having the number five pick this year is just an added bonus. That being said, I believe the rich could get even richer by selecting Kris Dunn, who is my sleeper pick. Dunn is a 6’4 205 lb point guard, whose game is NBA ready. Dunn is an elite playmaker with the ball in his hands and can pick apart any defense. That being said, his real value comes in his defensive game. In a three-point obsessed era of basketball, Dunn is a rare player who prides himself on his defense. Expect him to have an immediate impact for the Timberwolves, as he develops into a great NBA player. With both Dunn and Murray already off the board, the Pelicans will select the 2016 John R. Wooden Award winner, Buddy Hield. During his time at Oklahoma, Hield developed into an elite scorer, averaging 25 points per game in his senior season. There are some questions about his decision making and age (23), but if the Pelicans are able to develop Hield into an efficient scorer then he will be worth the 6th pick. The Nuggets could use a big man who won't allow himself to be pushed around on the block. So look no further than Domantas Sabonis, the 6’10 center from Gonzaga. Sabonis in a player who welcomes physicality and someone who will embrace whatever role the Nuggets need him to fill. Though Sabonis does struggle at protecting the rim, he will more than make up for it with his offensive abilities. Sabonis if far from a guarantee, but if all goes well he will be a welcomed addition to a deep Nuggets roster. It would make sense for the Kings to select a big man who could help out DeMarcus Cousins down low. However, I believe the Kings will instead fall in love with the athletic phenom, Jaylen Brown. Now I am not saying Brown is a bad pick, he already has an NBA ready body, and is an amazing rebounder for his size (6’7). I just worry that his talents will go undeveloped in a dysfunctional Kings organization. With Bismack Biyombo’s contract situation still up in the air, I expect the Raptors to take a big man with this pick. Jakob Poeltl is a big presence down low (7’1 240lbs) and someone who could help the Raptors on both sides of the ball. He is an excellent rebounder and an elite finisher around the rim. If Poeltl developes a face up offensive game as well as gaining strength, he could be a valued asset come next year’s playoffs. Expect Milwaukee to continue the trend in this draft of taking big men. While many of this year’s draftees ability to develop can be questioned, one fact still holds true; you can’t teach height. At 7 feet tall, Skal Labissiere dwarfs almost everyone around him. Before this past season he was seen as one of the most talented players in the nation. Unfortunately, his effort and willingness to improve was questioned as the season played on. Still if the Bucks take Labissiere they will be getting a talented 7-footer who has the potential to become an NBA star. Davis is a raw talent whose athleticism has allowed him to become a dominant defender on the collegiate level. However, to succeed on the NBA level Davis will need to develop an offensive game. I think Davis to Orlando will be a great selection due to their new coach’s (Frank Vogel) ability to develop young talent. Davis is far from an NBA ready player, but is someone who could really make an impact on the Magic’s roster two years from now. Utah’s pick is a tricky one for me to pick. Many believe they will take Vanderbilt star, Wade Baldwin, but I feel that they have taken too many point guards in previous drafts. They need to add a three point threat, someone who can space the floor and knock down key shots. That is why I believe they will select Malachi Richardson with the 12th pick. Besides Jamal Murray, Richardson is the best pure catch and shoot player in this year’s draft. He would be a welcomed addition to a Jazz team trying to compete in a loaded Western Conference. After taking a big man with their fourth pick, the Suns will look to add athleticism to their wing. Marquese Chriss is just the athlete the Suns will be looking for. He is unpolished and lacks court awareness, but his ability to run the floor and attack the rim will make him a valuable asset. If the Suns could harness Chirss’s athletic ability and turn him into a disciplined defender, then they could end up “winning” the 2016 NBA draft. With a lot of questions surrounding the Bulls roster I think the Bulls will draft Ante Zizic to help an aging Gasol. Now this will be a surprising pick to many, but I believe Zizic’s high motor and ability to finish around the rim will inject some much needed energy into a troubled Chicago locker room. Korkmaz is a safe and uncontroversial pick for the Nuggets. Many of the fans won't know who he is but on paper he looks like a no brainer pick. Any team can use a 6’7 guard who can knock down threes, and the Denver Nuggets are no different. I don’t believe he will ever become more than a role player who can hit the occasional three, but many teams in the NBA are looking for a guy just like that. The Celtics have more picks than they know what to do with, that being said if they still have this pick come draft night they are going to have to take someone. That someone will be Michigan State star, Denzel Valentine. Valentine is an elite offensive player who can score anyway he wants. He also can distribute the ball and accumulate rebounds with ease. If he improves on the defensive end, I believe this “throw away pick” will turn into the franchise's best pick of the draft. In many people’s eyes Baldwin being taken at 17 will be a drop for him. Even so, I think Wade Baldwin will find a great home within the Memphis roster. With Mike Conley potentially leaving during free agency, Baldwin could get the opportunity to develop into a high level NBA point guard. He won't be an impact player come day one, but give him a year or so and I think you’ll see Memphis made the right decision taking him here at 17. The Pistons desperately need offense from their wings. That is why I believe Beasley will shock everyone and jump to 18 here in the draft. Beasley is a great pure shooter who has a high basketball IQ. Although at times he has been known to be a ball hog, I’m confident that once he gets to Detroit he will learn to pass the ball, one way or another. The Nuggets have enough draft picks that they can gamble on this late round selection. Diallo is far from a guarantee but possesses great length and mobility for his size (6’9). He is limited offensively, but if he commits and works hard I believe he could turn into a great defensive specialist. The Pacers have too many point guards on their roster to take another one, that is why I think they will select Brice Johnson. Johnson’s game is a perfect representation of Indiana’s blue collar mindset. He is an amazing rebounder and athlete. Johnson will need to gain some weight if he hopes to stick around but if he can, watch out. He may have the quickest second jump in this draft. If the Pacers new coaching staff can help polish his offensive game then they will have found a real gem late in this 1st round. Taurean Prince in an athletic 6’8 guard who can instantly help any NBA team who selects him. If he is available by the time Atlanta has this pick, then they will take him. His defensive ability will instantly solidify an already formidable backcourt. Now, Price is also a very raw player, who is known to be careless with the ball. However, if he learns to play to his strengths, he will be another great player for the Hawks. This late in the 1st round, teams stop looking for the “right fit” and instead go for the best available talent. That is why the “Canadian High School phenom” Thon Maker, will end up with the Hornets. Not much is known about Maker by the general public, nothing besides the occasional HoopMixTape highlight. That being said Maker could end up being a solid NBA player. Maker is a rare athlete, seeing how he moves on the court you wouldn’t think he was 7’1 and 225lbs. He is maybe the most undeveloped player in the draft but if taught the right skills and taken care of in the right environment, Maker’s ceiling is as high as NBA super star level. By now many fans will be tired of seeing the Boston name up on the draft board, but not the Celtics. They will have the opportunity to steal Diamond Stone at pick number 23. Stone does make poor decisions on the court, struggles to score, and needs to refine his rebounding techniques. All that being said, he has an NBA ready body (6’10 254) and at 19, Stone has the potential to develop into a dominant physical presence in the paint. Put simply, the 76ers have taken too many big men in recent drafts. Jackson is the total opposite of what the team has been seeking in the past. At 6’1, he is definitely an undersized point guard, but what he lacks in size he makes up for in his dynamic scoring ability. Jackson in an explosive pure scorer, whose handle allows him to get anywhere he wants on the court. Honestly it's hard to see him being taken this late, but trust me, Philly will not complain come draft night. Bembry is a physical defender, whose athleticism will help him come day 1. Bembry will develop nicely thanks to veterans like Chris Paul and his coach Doc Rivers. Don’t expect Bembry to contribute much offensively though, he will come off the bench and provide meaningful defensive minutes for a team who hopes to contend for a title next year. At this point the 76ers will just be trying to accumulate talent. Murray is an awesome athlete who has a great feel for the offensive aspect of basketball. Even though he struggles from behind the three point line and turns the ball over way too much, he still can contribute to an NBA roster. He may never become an important member on a championship level team, but could stick around as a role player on below average teams. Luwawu is an interesting player. Coming from France, not much is known about him by the average fan, but trust me he is worth the 27th selection. He can take and make a variety of shots and would be a welcomed finisher in transition. He does struggle to create his own offense but luckily he can rely on stars like Lowry and DeRozan to get him the ball. Luwawu most likely will never become a star, but that being said he will be able to contribute to the Raptors' 2016-2017 championship efforts. Not much can be said for this pick, the Suns need to choose someone and Bentil wants to play in the NBA. I'm not very confident that Bentil will work out in the NBA. He's a 6’8 forward who struggles to rebound and possesses a very limited offensive game. He is in very good condition which will allow him to contribute to the Suns' fast break offense and defensive efforts. Only time will tell if Bentil can stick around in the league. This pick gets me excited just thinking about it. Tyler Ulis is the perfect fit for San Antonio and the Spurs are a perfect fit for Ulis. I understand that at 5’9 Ulis is almost comically undersized, which is why I believe he will drop so low in the 1st round. That being said, he is one of, if not, the best ball handlers in this draft class. Ulis can score in just about any way possible and is an elite floor general. Ulis will get the opportunity to slowly develop into a starting point guard’s role as Tony Parker ages. This pick will end up being another steal by a franchise who consistently finds gems in the draft. After losing in the NBA Finals, the Golden State Warriors will spend more time focusing on free agency than the 30th pick in this years draft. I expect them to select Qi because he stands at an impressive 7’2. At best the Warriors will put him on a serious weight lifting regiment and hope he bulks up. Who knows Qi could even help in the Warrior’s future championship efforts….if he develops enough.